Holidays in Kalithea are ideal for both families and couples. This little town offers natural beauty, traditional restaurants, and some fascinating ancient ruins to be explored. Rhodes Town is just a 30-minute drive away and is ideal for day trips spent enjoying the excellent cuisine the island is known for, as well as bars and a choice of boutiques. The capital of Rhodes is the oldest inhabited Medieval town in the world, and offers a fascinating history just waiting to be discovered. Explorers can enjoy a variety of beach options in Kalithea, with the main beach offering a big, beautiful stretch of sand. If you prefer to explore, hire a car and drive to one of the little coves and bays which can be found along the rugged coastline. The town is also surrounded by forested mountains where visitors can make the most of the hiking and mountain biking trails. Kalithea is historically known for its healing medicinal spas, though the spring may have run dry a long time ago, there is a beautifully restored spa – where you can take in the sweeping marble arches, and beautifully intricate mosaics, created in an Italian style. The beach next to the restored spa is a great spot for snorkelling, and in the underwater caves it’s not unknown to come face-to-face with octopuses and squid. If you’d like to explore a little further you can take a boat to the town of Lindos, where you can visit the 4000-year-old Lindos Acropolis and take in stunning views of Lindos village below. Later, spend your evening sampling the local cuisine, there are some great little Greek tavernas you could spend your time in. For those that have a sweeter tooth, a visit to one of the local bakeries could be in order, how about treating yourself to some sticky baklava or tasty loukoumades? Choose Sovereign for your luxury holiday in Kalithea and you can take advantage of our expertise as we help you find your ideal hotel. La Marquise has landscaped gardens and interesting architecture, a private beach, and a choice of eight bars and restaurants. 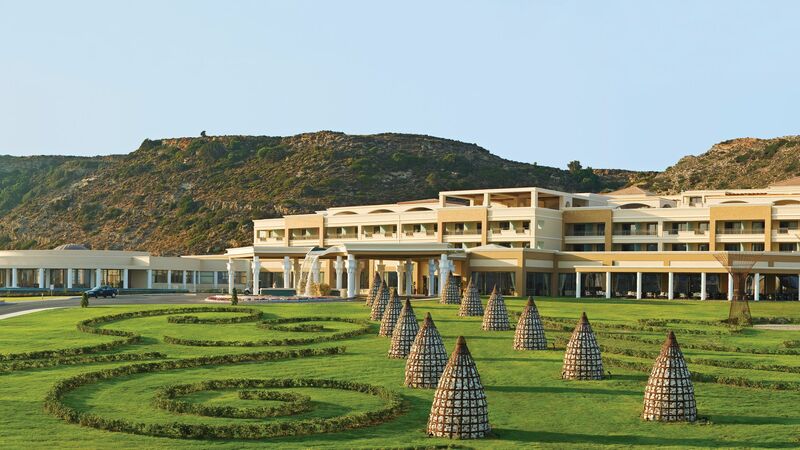 Alternatively, Elysium Rhodes Resort and Spa is a modern resort with extensive gardens stretching down to the golden sands and clear waters of the sea. 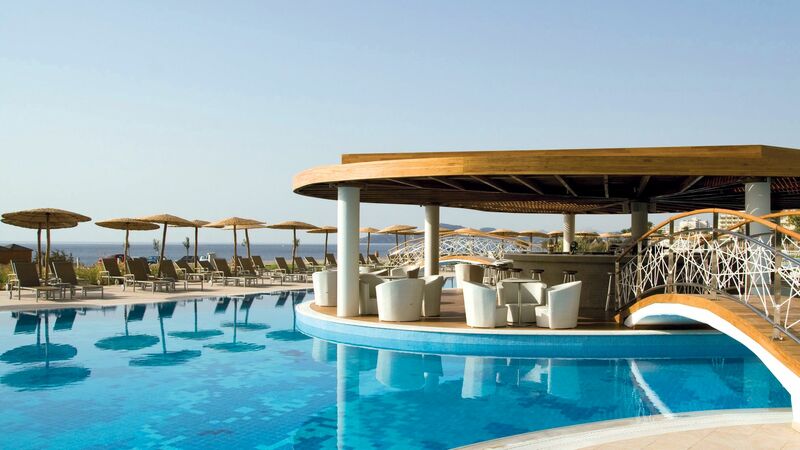 You will love dining in the restaurant in the middle of the pool or on the al fresco terrace. The flight to Rhodes is around 3 hours 45 minutes from the UK. Transfer time from Rhodes airport to Kalithea is approximately 30 minutes. Rhodes enjoys the most sunshine of any other Greek island – 300 days a year, in fact. Temperate springs and long, dry summers give you plenty of time to visit; the earlier months of the season suit sightseeing while the mid-summer months of July and August push 30°C – perfect for keen beach-goers. Even in the height of summer, the island’s cool winds take care of any humidity.